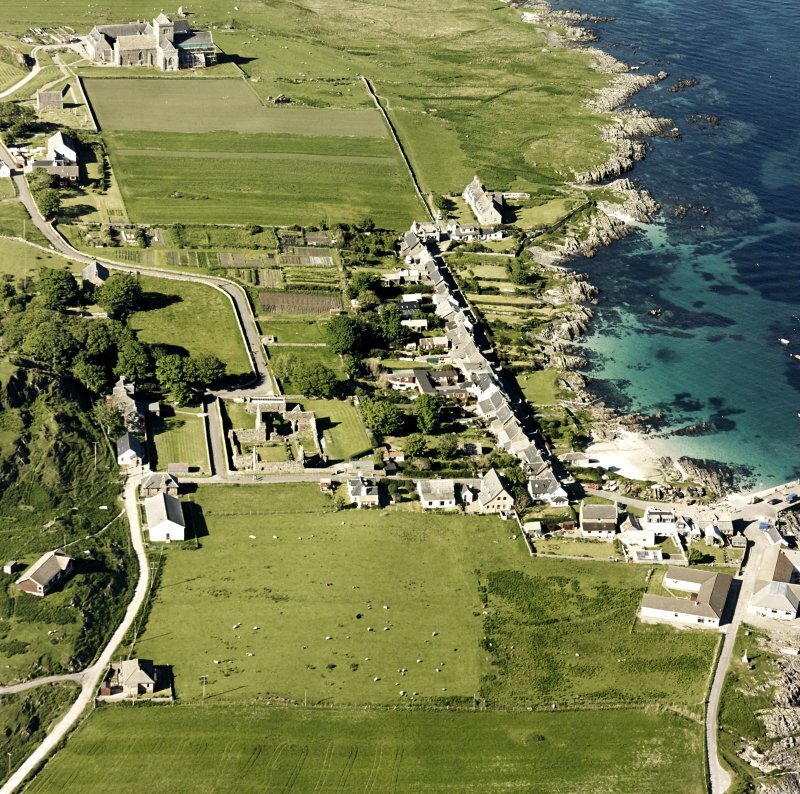 Oblique aerial view of Iona Nunnery, taken from the south east, centred on the nunnery. 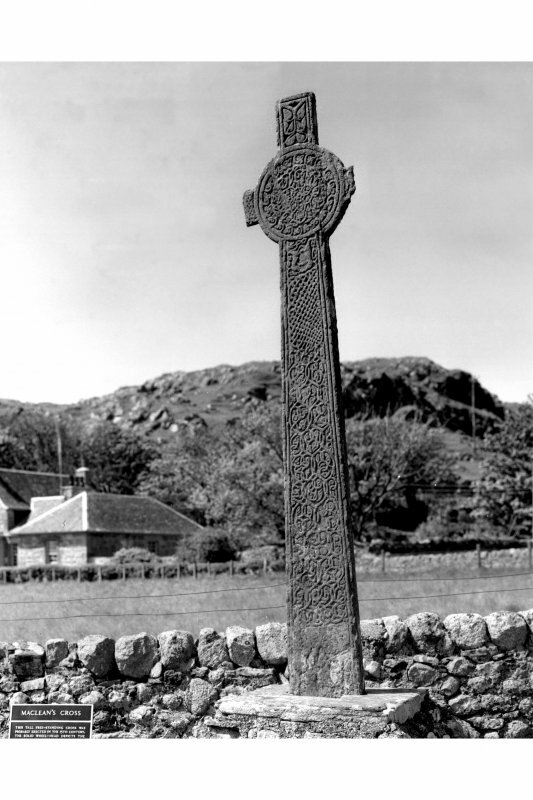 Iona, MacLean's Cross. 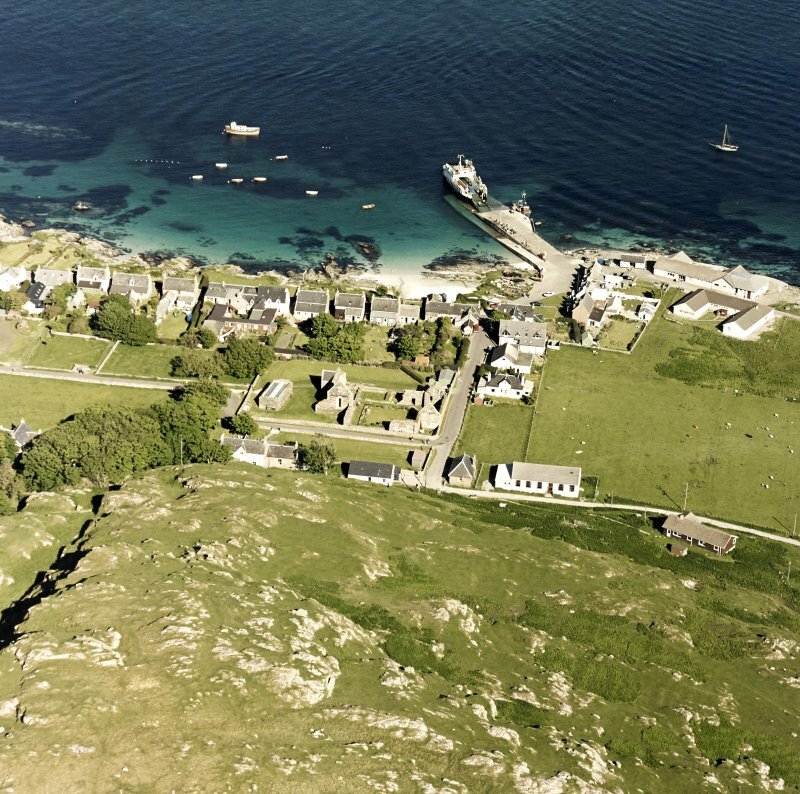 View of E. face. 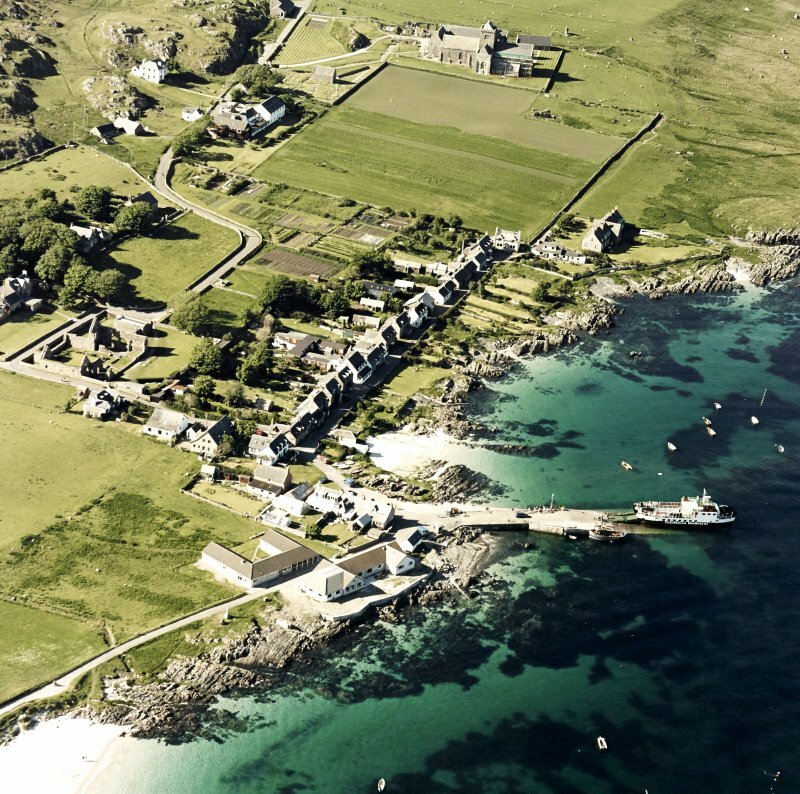 Oblique aerial view of Iona Nunnery, taken from the south west, centred on the nunnery. 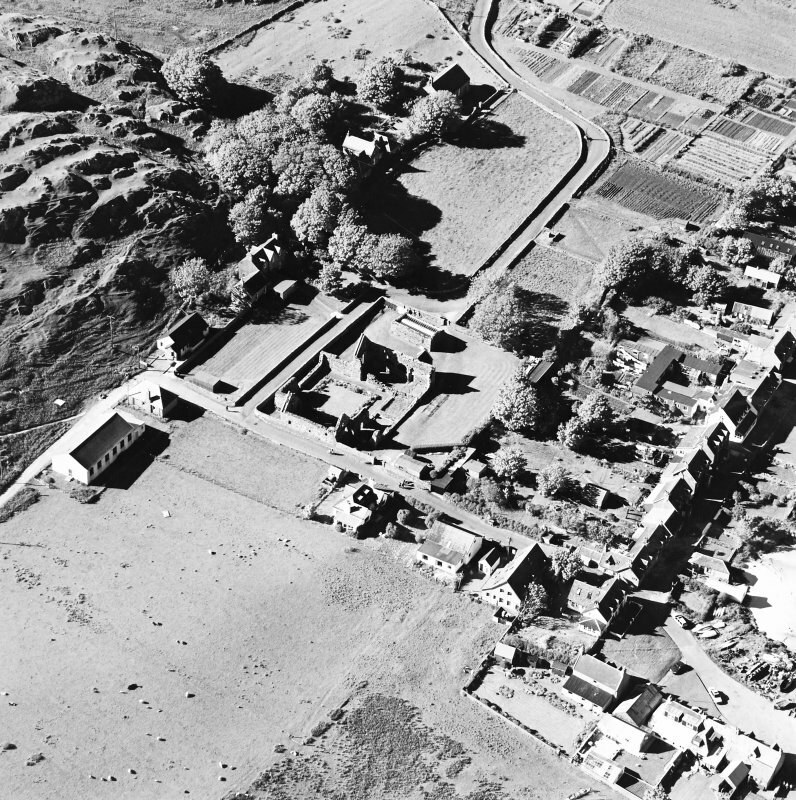 Oblique aerial view of Iona Nunnery, taken from the south, centred on the nunnery. 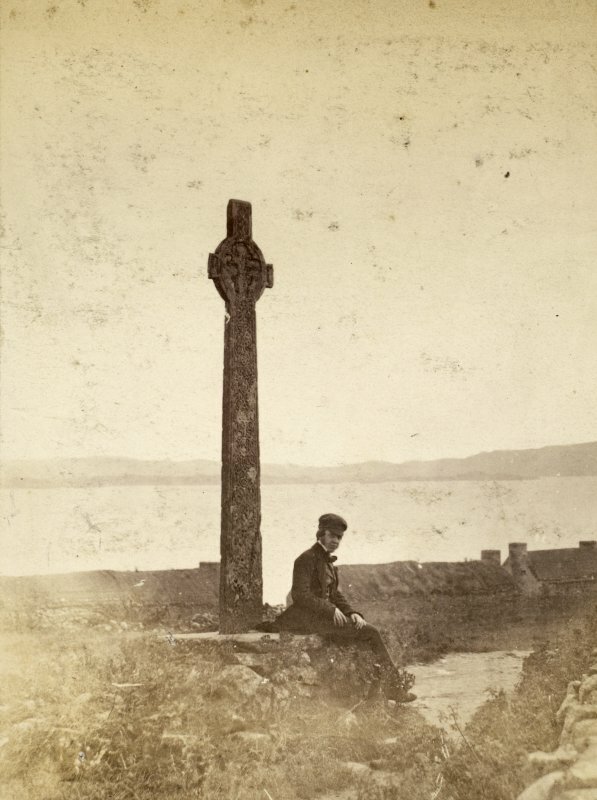 Iona, Maclean's Cross. Detail of view from West. 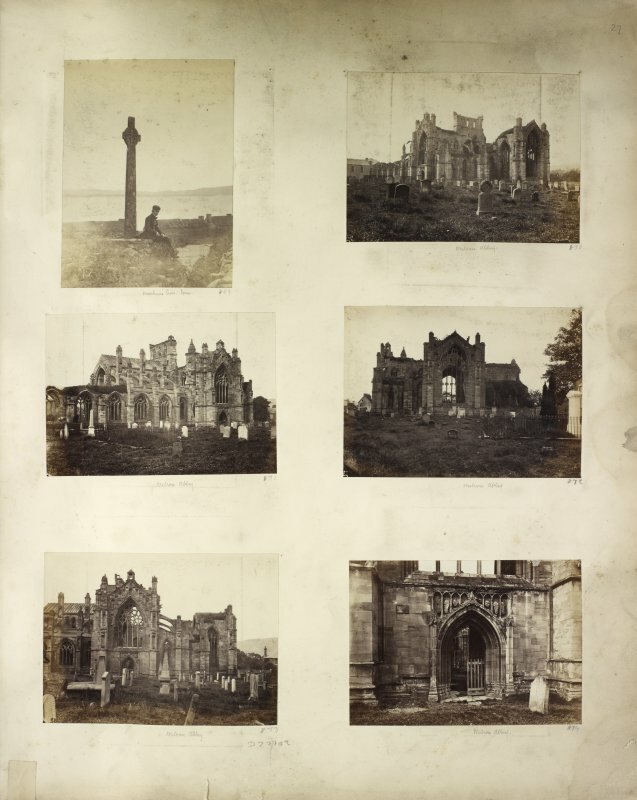 Album page showing crosses on Iona. 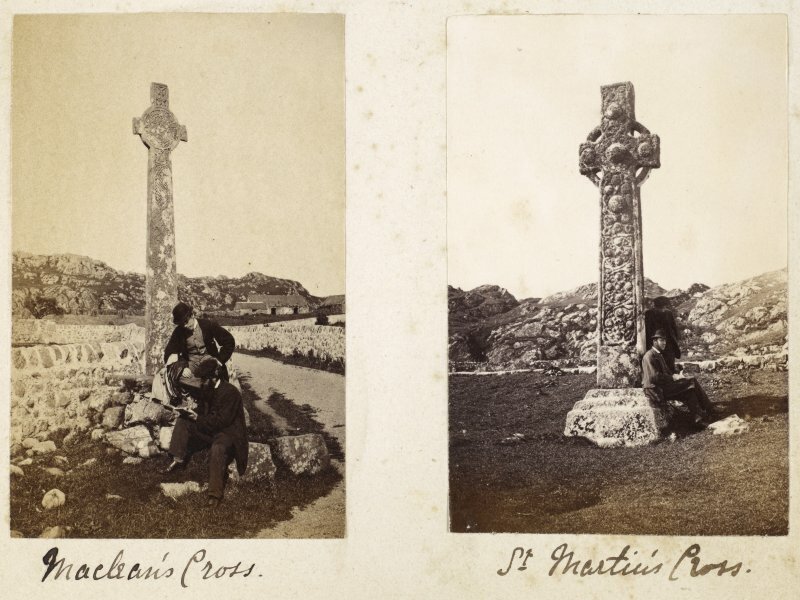 Titled: 'Maclean's Cross' and 'St Martin's Cross'. 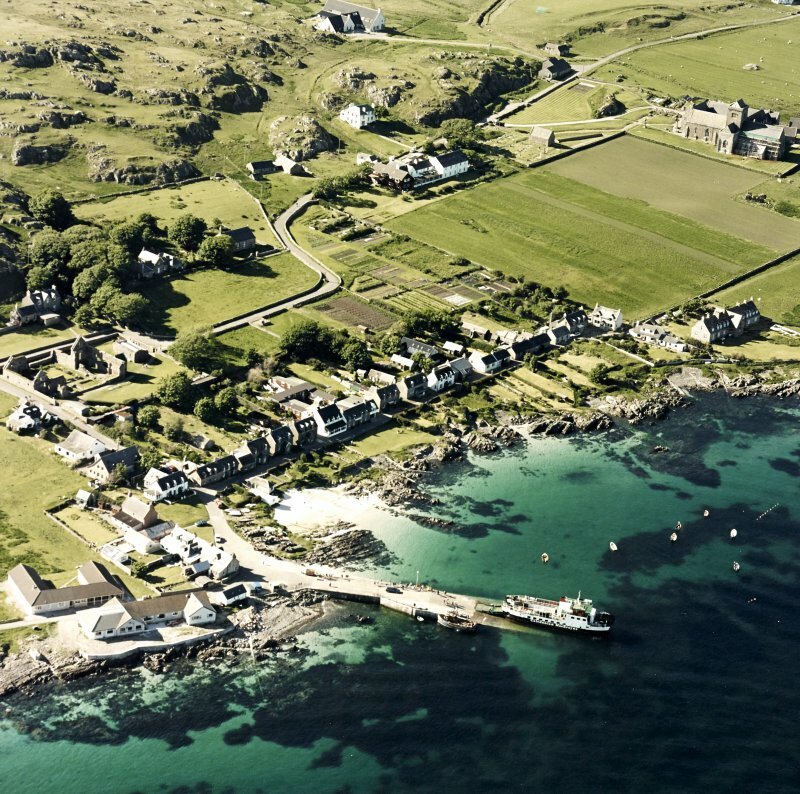 Iona, MacLean's Cross & Iona Parish Church. 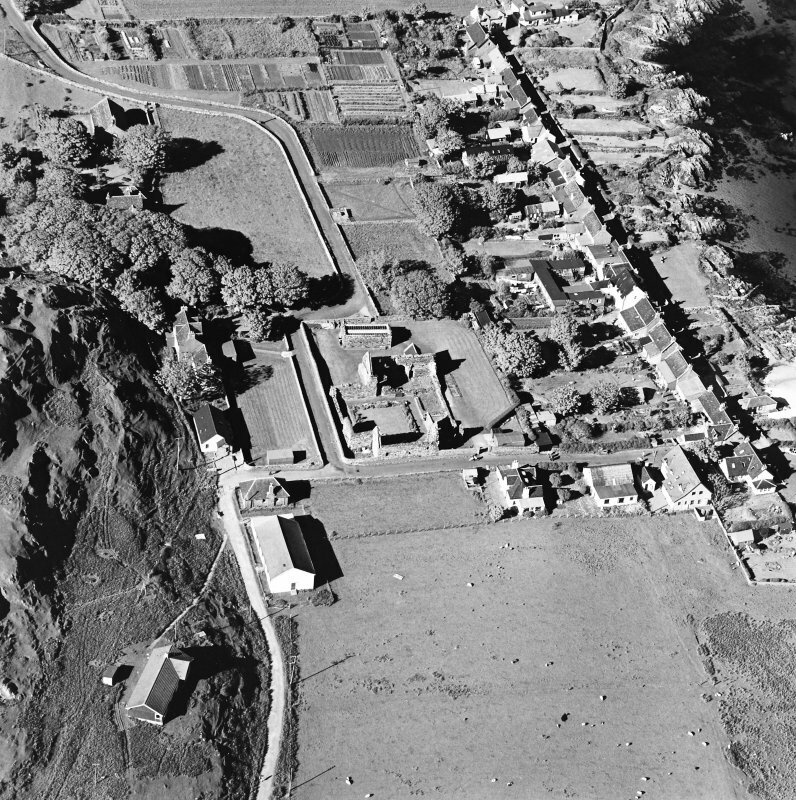 General view from East. 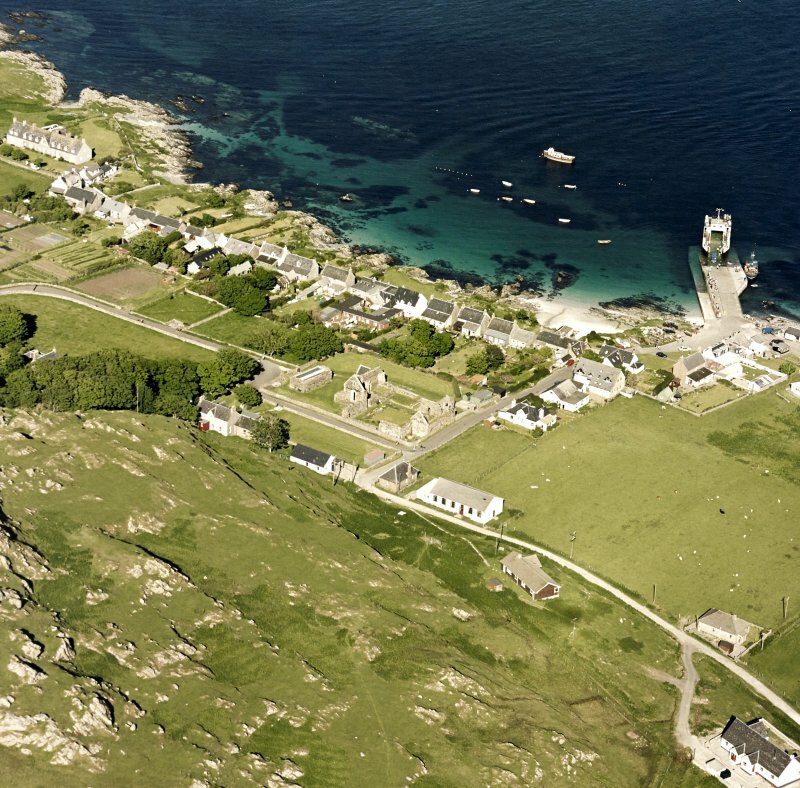 Iona, MacLean's Cross. General view of obverse face. 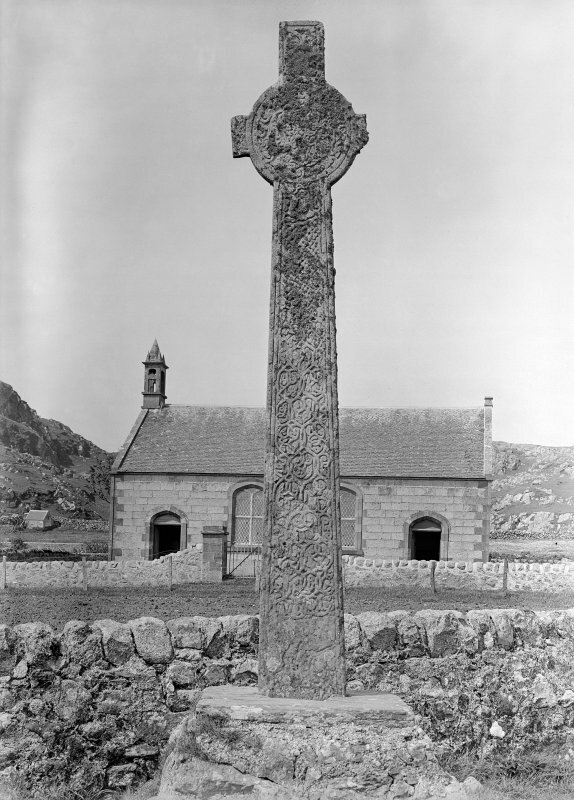 Iona, Maclean's Cross. View of East side. 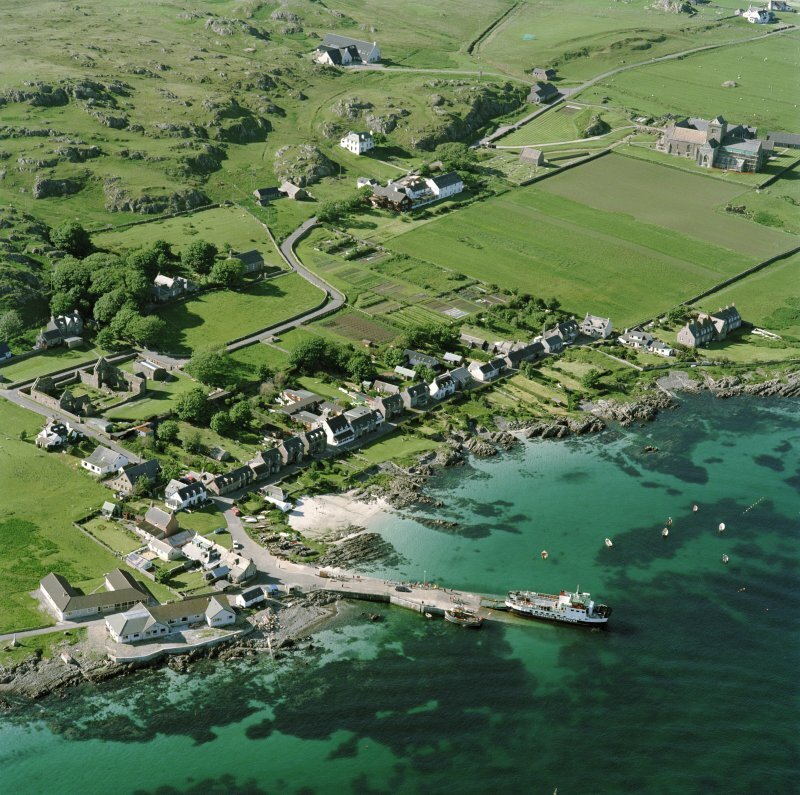 Iona, MacLean's Cross. Detail showing West face of head. 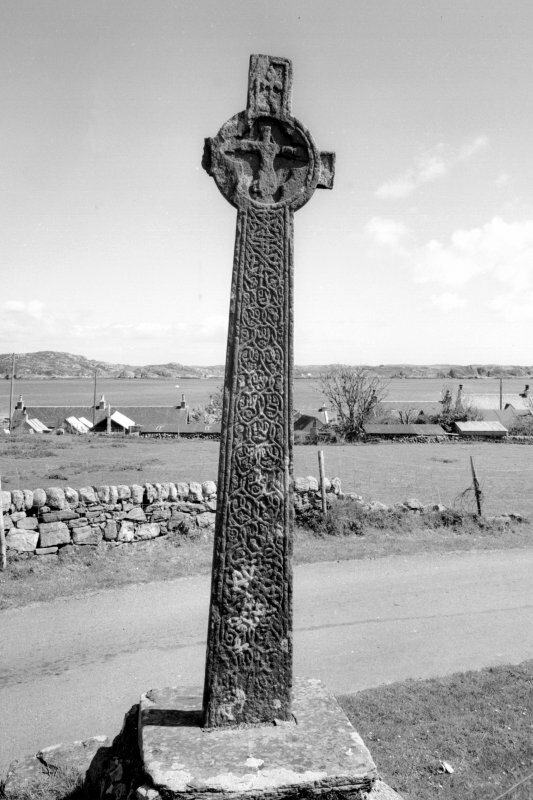 Iona, MacLean's Cross. View of reverse face. 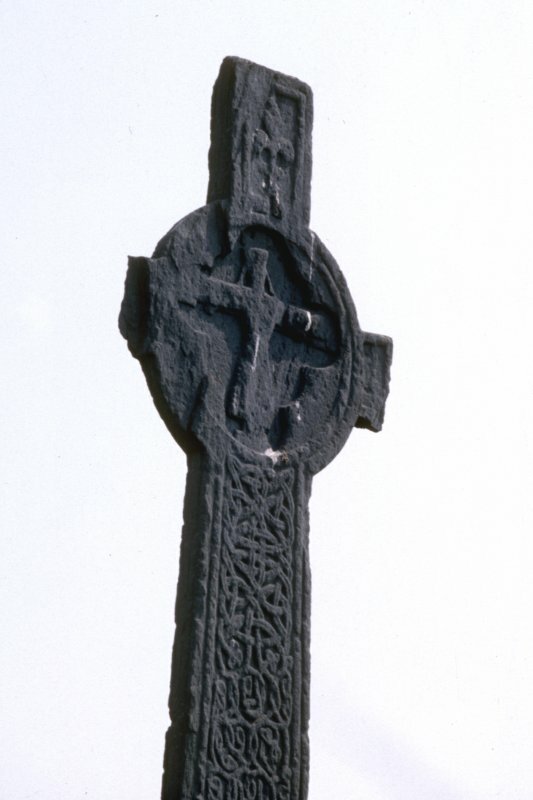 A fine, Hebridean-type, free-standing cross of the 15th c, displaying a crucifixion and foliaceous interlacing. 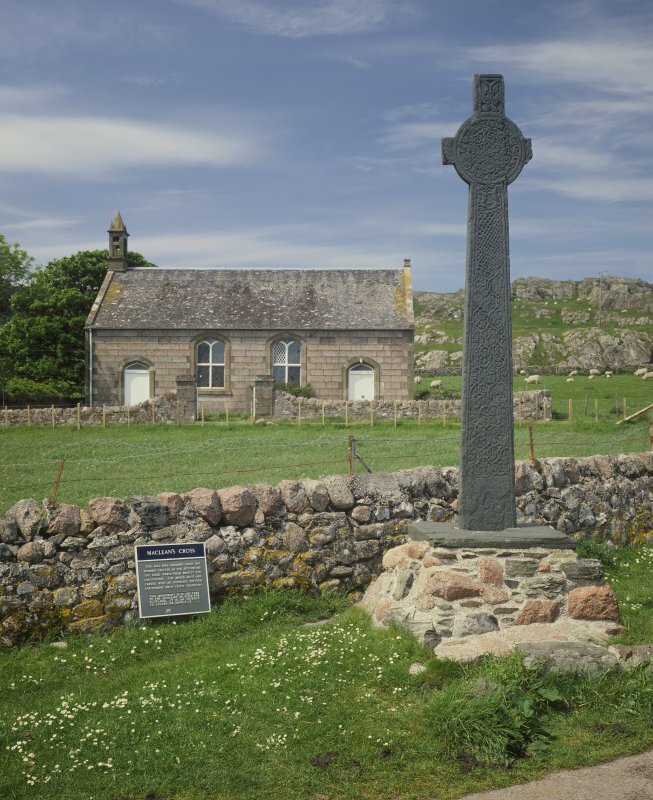 It is said to commemorate a MacLean of Duart. The present pedestal is more modern than the cross itself, which may support the tradition that the cross formerly lay within the grounds of the Nunnery (NM22SE 14). 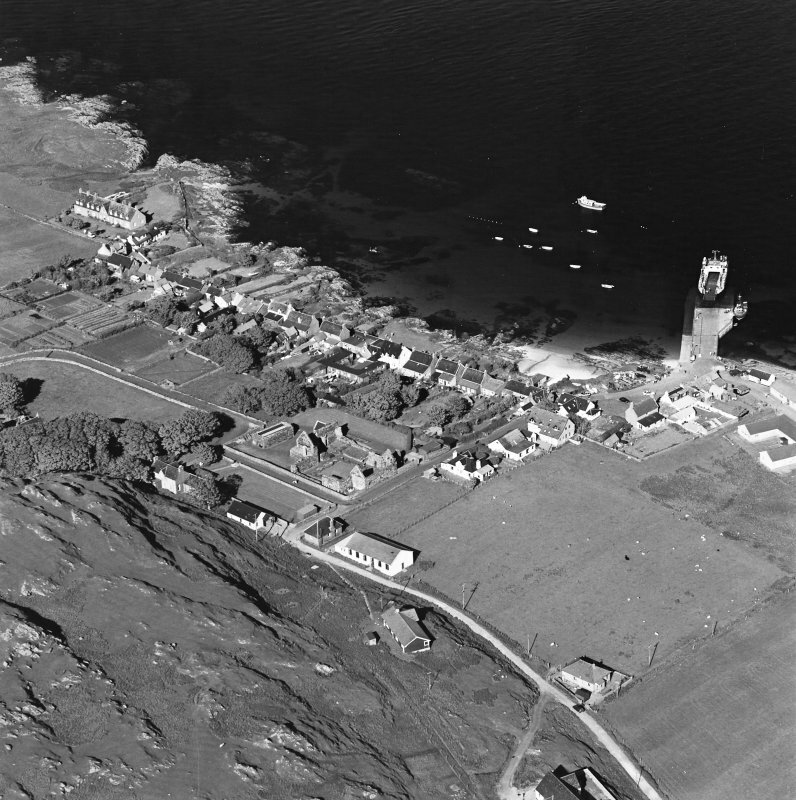 Visited by OS (RD) 9 June 1972. 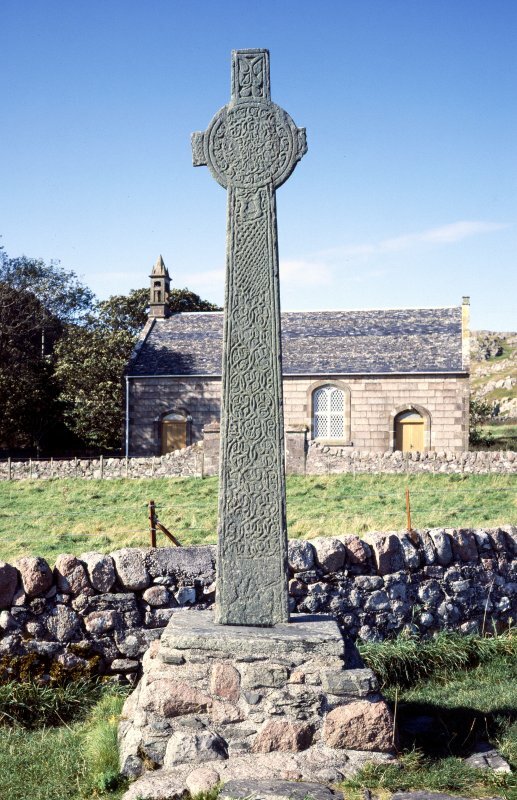 This monument consists of a freestanding cross of 15th-century date. It stands at the junction of three medieval streets, between the Abbey and the Nunnery. It is carved with dense interlacing and entwined foliage with a depiction of Christ crucified on the W face. The foot of the E face bears the inscribed figure of a soldier on horseback and an inscription which is no longer legible. 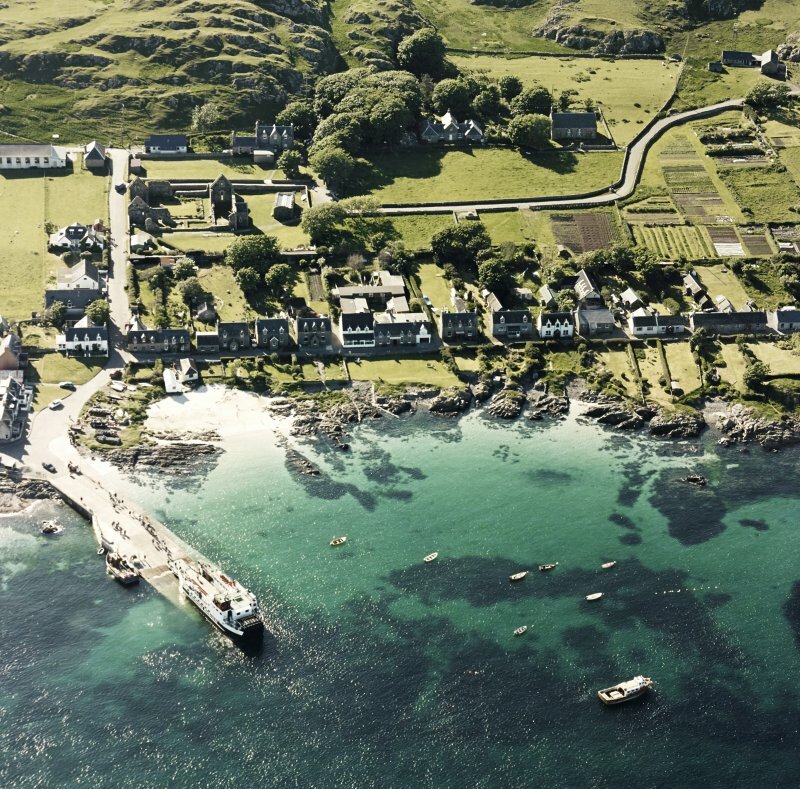 It is likely that this recorded the name of MacLean of Duart or Lochbuie, the most powerful family in the area at the time. The cross stands over 3m high. Information from Historic Scotland, scheduling document dated 5 August 1998. 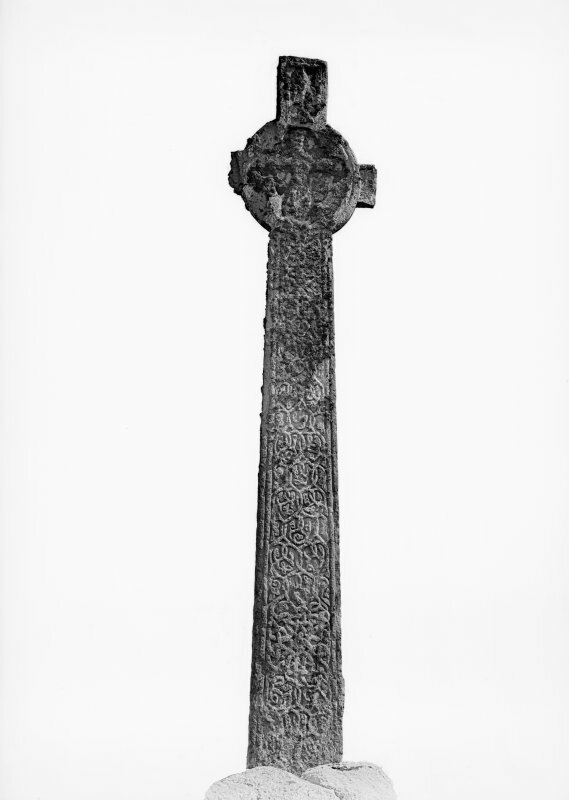 A free-standing cross of 15th century date, it stands at the junction of three medieval streets between the Abbey and the Nunnery. It is carved with dense interlacing and entwined foliage with a depiction of Christ crucified on the W face. The foot of the E face bears the inscribed figure of a soldier on horseback and an inscription which is no longer legible. 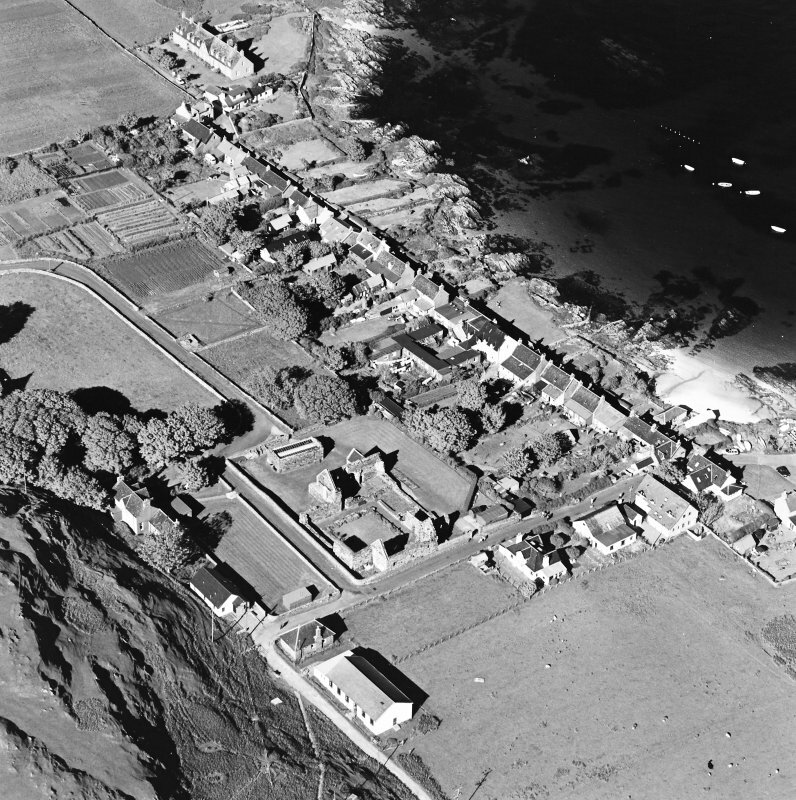 It is likely that this recorded the name of Maclean of Duart or Lochbuie. The cross stands over 3m high.